Commencing on the 1st August 2015, Emirates flight EK41, operated by a Boeing 777-300ER, will depart Dubai Airport at 02:35hrs and arrive in Birmingham at 07:05hrs. The outbound flight, EK42, will depart Birmingham Airport at 09:10hrs and arrive in Dubai at 19:10hrs. The additional service adds 7 more inbound flights a week to Birmingham, increasing passenger and cargo capacity on the route by 42%. Hubert Frach, Divisional Senior Vice President, Commercial Operations West, Emirates, said..
Paul Kehoe, CEO, Birmingham Airport said that Emirates’ decision to add a 3rd daily service to Dubai and beyond from Birmingham Airport clearly shows the strong demand that exists in the city and the region for passengers who want connectivity to Dubai, Asia and Australia. “Since the carrier began flying from Birmingham 14 years ago, passengers have been telling us how much they value the route and the excellent service they receive, so today’s announcement is great news for everyone. 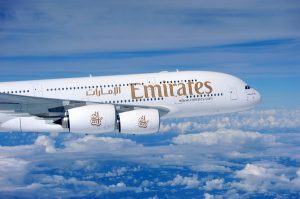 In addition to increased frequency, this new third service will operate on a three class Boeing 777-300ER, meaning passengers will be able to experience their excellent first class suites, the first time it has been offered on this route,” he added. The new daily service will be operated with a Boeing 777-300ER aircraft in a 3 class configuration. The added capacity provides 8 Private Suites in First Class, 42 Business Class seats and 310 Economy Class seats per day.